Back in 2015 Australian daredevil Robbie Maddison made history when he released the video of him riding his bike on the water, a video known as “Pipe Dream”. Robbie surfed the waves with his modified motocross bike just like a surfer does with his surfboard, and we thought he was done with these kind of tricks. But the Aussie is back on the water again, and this time in The Hague, Netherlands. Love this angle of a start I did yesterday here on the Hague. 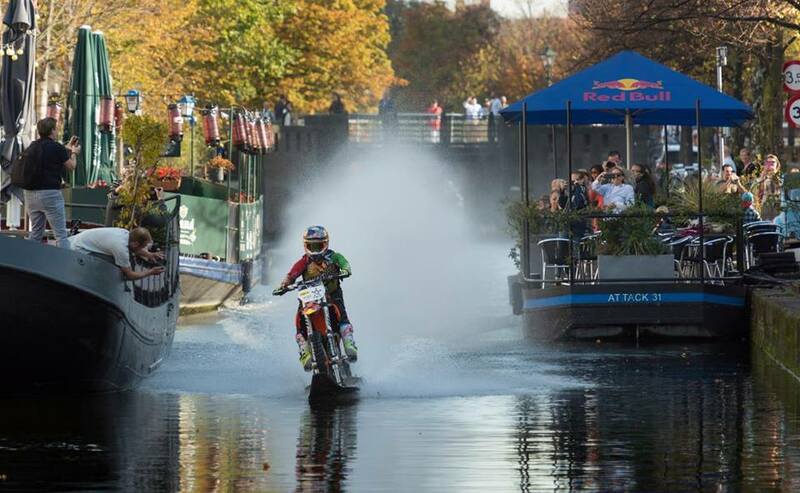 Robbie Maddison took his KTM bike on a canal at The Hague as part of a promotion for a Red Bull event, the Knock Out 2018, which will happen on November 10. He will take part in this special beach race, but until then, we will see him promoting the event with all kind of stunts like the one we can see on the behind the scenes video the 37-ywar old Aussie published on his official Facebook page. Would you try riding your bike on the water like Robbie Maddison?